In the United Kingdom, especially at breakfast, no one would give up their slice of bread and preferably a freshly baked bread. The choice is very rich, going from cereal to soft white bread. 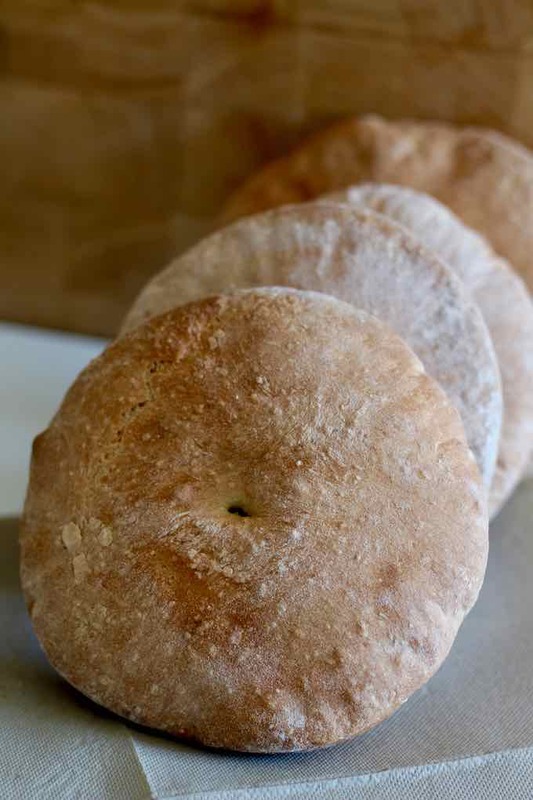 Today, we are talking about stottie cake or stotty. Paella Valenciana from Spain, sauerkraut from Germany, biryani from India, bacalhau from Portugal, boeuf bourguignon from France. 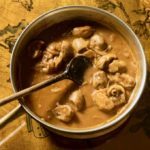 It is not necessary to be an expert in gastronomy to know at least one of these mouthwatering dishes that are representative of each country. And what about English cuisine? When it comes to English cuisine, it often leads to humorous notes. George Mikes, a British writer born in Hungary, especially famous for his humorous comments on various countries and their citizens, wrote in the mid-twentieth century: “on the continent people have good food; in England people have good table manners”. Some will say that there is no English cuisine and others, more cautious, will highlight fish and chips as a representative dish. 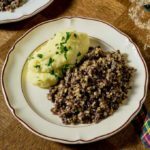 British cuisine has never achieved major international recognition, even though it is full of typical and traditional products. It has always been multicultural, a result of the continuous contaminations that Anglo-Saxon culture has undergone during its long history. For example, the British adopted the tradition of tea from China, and the curry from India. Despite the ever-increasing popularity of fast food or ethnic restaurants, the English culinary tradition still exists in Great Britain. It is mainly composed of roasts and stews made from meat and vegetables, but also desserts, many of which are famous and appreciated around the world. According to tradition, each region of England offers different variations depending on the meat used: beef, lamb, pork, chicken. Generally, the meat is accompanied by inevitable vegetables and in particular potatoes. Potatoes are a fundamental part of English cooking, as they complement many traditional recipes, and there are several variations and methods of preparation. In English gastronomy, you will find many nuances and influences from other cultures. For example, it is very common to find delicious Anglo-Indian dishes. These flavors are the result of the long colonial British period in India. Many other English habits have been brought from India, and gastronomy and the fascination with Hindu flavors is part of it. Many of the great British culinary recipes come directly from India, such as the famous Worcestershire sauce, chutneys, curries or dishes such as the delicious kedgeree: fish (usually smoked), boiled rice, eggs and butter all seasoned with curry, turmeric, coriander, and cream or yoghurt. 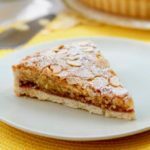 What are the most popular dishes and meals of English cuisine? – English breakfast, the most typical and best known meal of English cuisine. 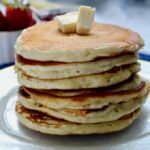 It usually consists of toasts with butter and marmalade, eggs, bacon, grilled sausage, potato pancakes, baked beans, and cooked tomato. – Afternoon tea or tea time is England’s most famous ritual. A real daily tradition for the English, no tourist can go home without having tasted the five-hour tea. England is also full of tea rooms. 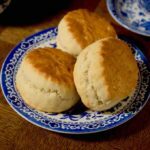 The tea is accompanied by biscuits and typical cakes such as scones, Bakewell tart, Eccles cake, and sandwiches of all kinds. 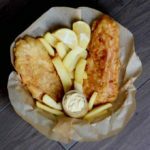 – Fish and chips, a typical English takeout dish. This is perhaps the most famous dish in the UK after breakfast. Raw fish, usually cod, is dusted with flour and dipped in a batter before being fried and finally served with French fries. – Jacket potatoes are the English version of baked potatoes, typically stuffed with a piece of melted butter and other seasonings, such as baked beans or cheddar. – The Sunday roast, the iconic Sunday dish. English families traditionally gather every Sunday for lunch, and the meal consists of a piece of roast meat, usually beef, accompanied by potatoes and seasonal vegetables. – The Yorkshire pudding, one of the most traditional recipes of the English cuisine, and certainly among the best known on the international scene. With a very simple preparation based on eggs, milk and flour, it is a kind of savory choux pastry. These small rolls are often served with roast beef. – Bangers and mash (sausages and mashed potatoes), which consist of pork or beef sausages and potatoes boiled and crushed to form mashed potatoes. – Pies. With shortcrust pastry, the English prepare delicious stuffed pies, usually considered as a main dish. The shortcrust pastry is stuffed, for example, with pieces of beef and kidneys cooked in beer as in the steak and kidney pie or with chicken and mushrooms. 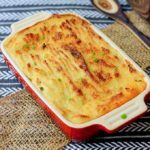 Shepherd’s pie, another unique dish typical of English cuisine, is made from mashed potatoes and lamb, similar to the French hachis Parmentier. 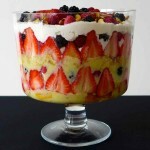 – England also offers delicious desserts such as trifle, Eton mess, sticky toffee pudding, or banoffee pie. In short, do not be fooled by those who superficially claim that English cuisine deserves no interest! Every corner of the world has its specialties and, if you really want to say that you have visited a place, it is good practice to be conquered by the local flavors that are offered to you, overcoming the hesitations that may not align with our eating habits. What is the origin of the scottie cake? 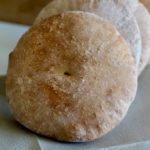 Let’s go back to our stottie cake, and do not be fooled by its name because it is not a cake but a traditional bread just like English muffin. The stotty comes from Newcastle, a city in North East England. It is an important and powerful symbol of identity for this region. 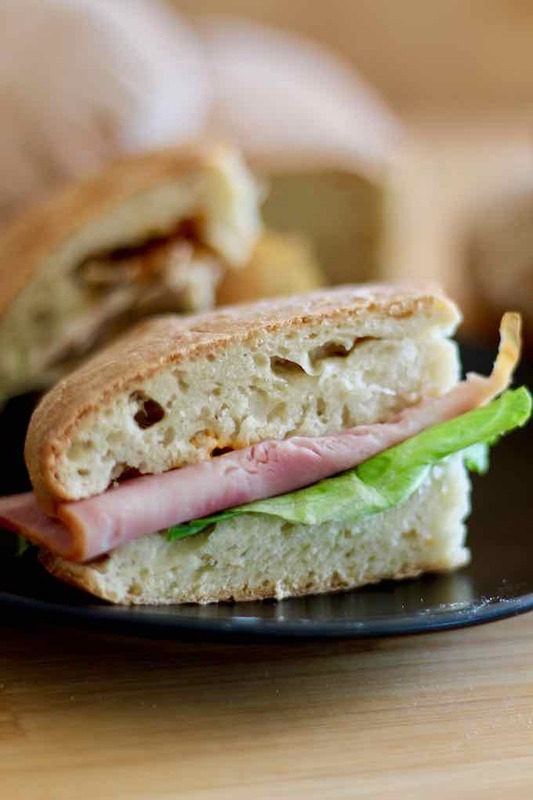 The word stottie comes from the verb “to stott” which, in vernacular geordie, means “to bounce”. The geordie dialect is native to the language spoken by Anglo-Saxon settlers in England. It also has Scottish and Irish influences and is today associated with the English who belong to the working class. The stotties are therefore very popular among the British of the working class and are said to be born of frugality. Stotty has even been described as a “pillar of the poor cuisine”. So what is the connection between “bouncing” and the stottie cake? Traditionally, bakers dropped it on the kitchen floor to determine if the dough had a good consistency. The dough that did not bounce was thrown away. For hygienic reasons, this practice was abandoned. The day’s failed dough was thrown and bounced in the charcoal to test the temperature in the coldest part for many hours. The stottie cake baked under an initial heat before continuing to bake while the oven was cooling. Originally, the stottie cake was a very thick and chewy bread that was baked for a long time in the coldest part of the charcoal oven. 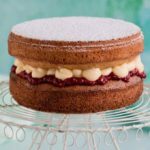 Thanks to modern baking techniques, cakes are now much lighter. 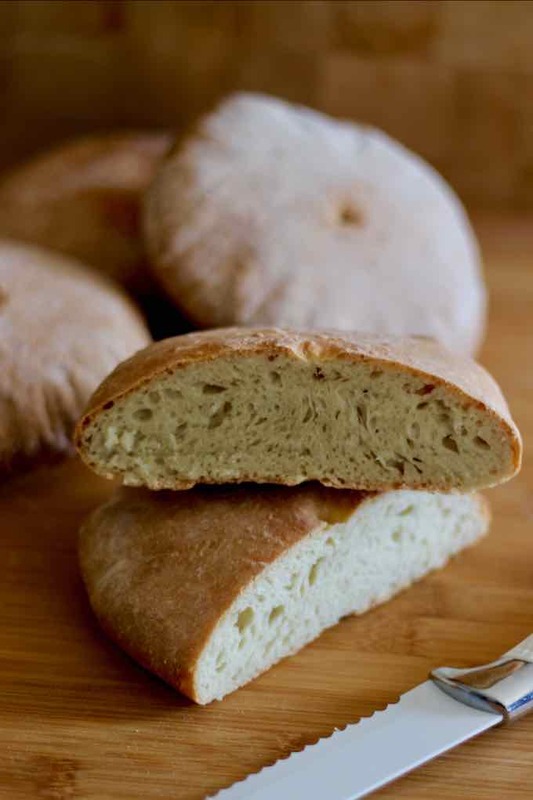 It is made from a simple white bread dough based on simple ingredients such as flour, yeast, salt, sugar and water, but due to its quick and unique rise and slow baking, you get a fluffy, round and flat bread. 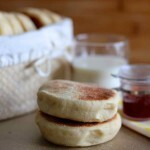 It is this slow baking method that gives the stottie cake a crispy but soft exterior, and a rather pleasant crispness, as well as this unique slightly acidic taste. Stotty may be the name of this delicious bread in Newcastle, but similar breads, with the same ingredients and the same method of preparation, are made in other parts of the United Kingdom. They are usually called oven cakes, oven bottom cakes or bread cakes. It does not matter what its name is and what you will fill it with when you split it. This bread is absolutely delicious! The stottie cake (stotty) is a flatbread originating from Newcastle in North East England, where it is considered as the powerful symbol of its identity. Mix the yeast and sugar and dilute in ½ cup of water. Let stand for 15 minutes in a warm place away from drafts. Add the flour and pepper into the bowl of a stand mixer and dig a well in the center. Add the yeast and sugar mixture and the rest of the water into the well. Using the dough hook, knead for 2 minutes at medium speed and add the salt. Continue kneading for about 5 minutes or until obtaining a soft and elastic dough. Place the dough on a lightly floured work surface and, while kneading, bounce it for 10 minutes. Put the dough back in the bowl of the stand mixer and cover it with a cloth. Let the dough rise for 1 hour in a warm place, away from drafts. Place the dough on a floured work surface and divide into two or three equal dough pieces. Form balls of dough and flatten them to a thickness of about 1 inch. 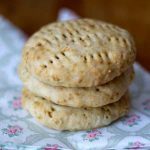 Using a wooden spoon or the end of the rolling pin, make an imprint in the center of each bread and place them well-spaced on a baking sheet lined with parchment paper. Bake the stotties for 12 minutes. Turn the oven off and continue baking for 30 minutes. 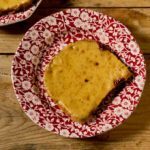 Serve hot or warm with butter, marmalade, molasses, honey, cheese, split pea purée, or ham.